Whilst handing over the geodesic dome to the University of York we had some problems with the RTIBuilder failing to detect the spheres to generate the lp file. These problems were only apparent under Windows, using OS X the lp file could be generated without issue. Further investigation showed that the problem was the amount of memory available to RTIBuilder. This can be changed by starting the program with different options. The easiest way to do this is to create a new shortcut to launch the program. You must be running 64bit Java for this to work. The options given when creating a new shortcut to RTI Builder to fix the memory issue. 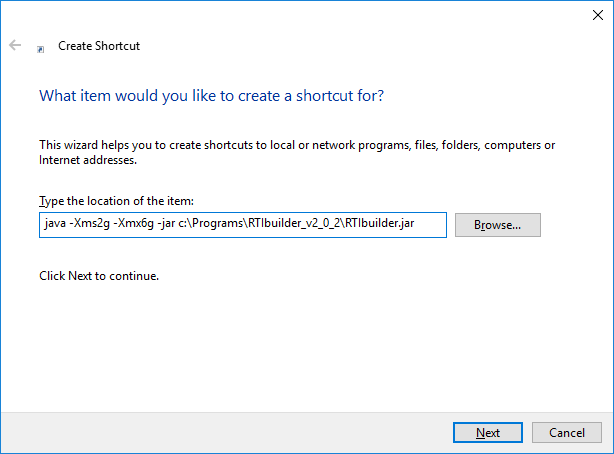 The c:\Programs\RTIbuilder_v2_0_2\RTIbuilder.jar needs to be changed to match the location of the RTIbuilder file on your system.